It's hard to believe, since he's still such a puppy, but Sunday was Gus's sixth birthday. Dahlin' Daughta bought him some presents, we took him for a beach walk, and we made a carrot cake (he loves carrots). He ate two pieces, and doesn't seem to have suffered any harm. You can hardly tell from this picture that he's backing away from the cake. The little tongue flick suggests otherwise, but he bolted to the other side of the room right after this was snapped. Gus, although in all other ways flawless, is kind of a Nervous Nellie. Thunderstorms, firecrackers, sudden strange behavior (perhaps not as uncommon at my house as one might like), will send him scurrying for protection. Last Friday, the wind blew hard all day, with gusts up to 50. At about 1:00 in the afternoon, Gus couldn't take it any more and crawled up into my lap as I was reading. Stayed for an hour, eventually falling asleep. After a while, I got hungry and threw him off to go get lunch. After lunch, he crawled back up for another half hour or so, until the wind began to die down. 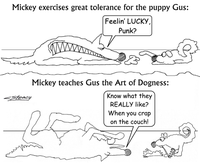 We tend to think of Gus as a little dog, because Mickey was a lot bigger. But at 65 pounds, this mutt was never intended to be a lap dog. He's nice and warm, though. I've just discovered a breed of dog that may help explain Gus. It's a Norwegian Buhund. Sounds like I made it up, but it's a real breed, and it looks just like Gus. Except that, at 65 pounds, Gus is way too big for a dog that tops out at 40. And his ears flop over. Maybe he's just defective.